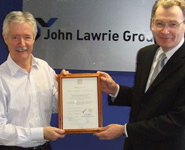 Scottish metal reprocessing, steel trading and environmental services company John Lawrie (Aberdeen) Limited, part of the John Lawrie Group, has secured an internationally recognised quality management standard. The Aberdeen-based firm gained the quality management standard ISO9001:2008 following an independent evaluation of its management practices. Achieving the standard shows that it has proven processes in place to meet customer requirements, and reflects the company’s commitment to quality, excellent customer service, improving efficiency and reducing waste. ISO9001 certification complements the ISO14001 environmental standard which John Lawrie gained in 2008, and will assist with the continued expansion of the company by providing peace of mind to clients. Established in Aberdeen in the 1930’s as a scrap metal merchant, the John Lawrie Group now offers a diverse range of industrial services and has developed an enviable reputation for quality customer service. It is one of the country’s leading privately owned companies and has operations throughout the UK and in USA, Europe, the Middle East, and China, employing a 100 strong workforce.